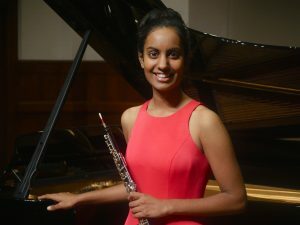 Praised by the Seattle’s SunBreak Magazine for her “nuanced phrasing and smooth shaping,” oboist Bhavani Kotha is equally at home as a soloist, chamber musician, orchestral musician, and teacher. She has been featured as a soloist with the University of Southern California Concerto Chamber Orchestra, Inner City Youth Orchestra of Los Angeles, and Royal Conservatory Orchestra. 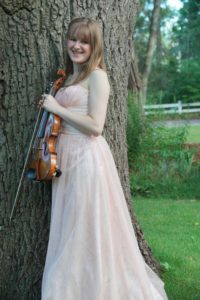 In recent summers she has participated in Sarasota Music Festival, Eastern Music Festival, Marrowstone Music Festival, Hot Springs Music Festival, and the Vancouver Symphony Orchestra Institute in Whistler. A passionate teacher, Bhavani teaches private lessons, masterclasses, and sectionals. She is a teaching artist at Earl Haig Secondary School. Bhavani holds degrees from the University of Southern California Thornton School of Music and the University of Washington. She is currently pursuing her Artist Diploma at the Glenn Gould School at the Royal Conservatory where she is a student of Sarah Jeffrey. Violinist , pianist, violist and composer Leslie Ashworth has performed in Carnegie Hall, Koerner Hall, and the Vancouver Convention Centre. Grand Prize winner of the Canadian Music Competition, Leslie is an alumnus of the New York String Orchestra Seminar, Tafelmusik Baroque Summer Institute, National Academy Orchestra, Banff Centre, and the Aspen Music Festival. Leslie received the Lieutenant Governor’s Community Service Youth Award for founding the Suite Melody Care volunteer program (www.suitemelodycare.com). In addition to her classical studies in violin, viola and piano, Leslie enjoys studying and playing jazz piano. She has also studied Celtic fiddling on Cape Breton Island, Nova Scotia. Leslie loves playing chamber music with her colleagues and mentors and also enjoys teaching the violin and piano at the Oakville School of Music. Composing is another of Leslie’s favourite ways of expressing herself – she has created over 30 original pieces. Leslie plays on a 1696 Albani violin on loan to her by a generous benefactor. A full scholarship student of Barry Shiffman and Paul Kantor, Leslie is studying her Bachelor of Music Performance at the Glenn Gould School. She has released her third CD/DVD. For dates to hear Leslie perform live, visit www.leslieashworth.ca. Fifteen-year-old Toronto-born pianist, Naomi Wong, began her piano studies at age 6 with Rachel Yu. In 2010, she started lessons with Ken Marple, who currently teaches her at the University Settlement Music and Arts School. Since 2011, she has participated in various annual music festivals and competitions including the Toronto Kiwanis Music Festival, Neapolitan Music Festival, and University Settlement’s Scholarship Audition, where she has garnered many awards and scholarships. 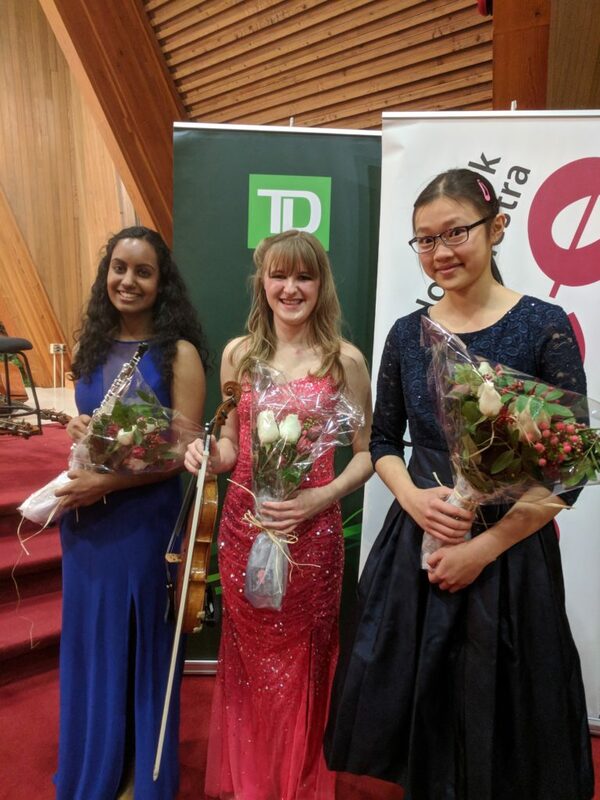 She has been selected to compete at the Provincial level for the past four years, and this year won two 2nd place awards in the ARCT Piano and Senior Concerto categories. Naomi has also provided piano accompaniment for the children’s service at her church since she was 6 years old and does extensive accompaniment for vocalists and instrumentalists at her public school and her music school. In addition to performing and accompanying, she teaches piano to students in her neighbourhood. Currently Naomi is in grade 11 at Harbord C.I. located in downtown Toronto. As well as being an accompanist, she is also a violinist and flautist in her school orchestra. When she is not busy practising one of her three instruments or doing school work, Naomi enjoys solving math and logic puzzles, knitting, reading, and going on canoe trips. 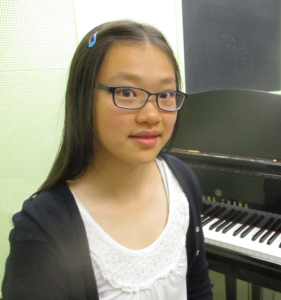 After high school, Naomi hopes to pursue post-secondary education in piano performance.